Tencarva provides Industrial & Municipal centrifugal pump repair for most major brands including but not limited to: ITT Goulds Pumps, Gorman Rupp Pumps, Goulds Water Technology a Xylem Brand, Gusher Pumps, Price Pumps, MP pumps, MTH Pumps, T-Mag and many more. There are many things that can go wrong with a centrifugal pump: Worn and damaged impellers and casings, leaking mechanical seals, damaged bearings, and many other malfunctions that can bring your process to a screeching halt. 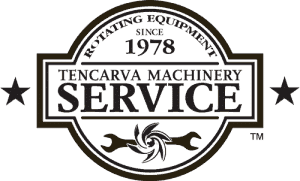 Tencarva specializes not only in fixing your pumps but many times we can make suggestions to improve the system conditions at the root cause of the failure. We see literally thousands of pumps come through our shops and the advantage of this volume is becoming very good at determining what and why failures occur, and knowing how to fix and prevent them.